Herbin worked in a cubist style from 1909, and in 1912 he participated in the historic exhibition of the Section d’Or. In 1931 he co-founded the association ‘Abstraction-Création’ with Vantongerloo, the headquarters of which was at Herbin’s flat at number 26 boulevard Masséna. 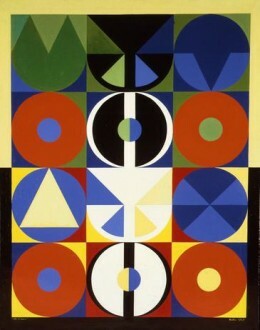 It brought together the short-lived group ‘Cercle et Carré’, which included most of the abstract artists. A militant of pure abstraction, Herbin had to wait until the post-war period to receive general recognition, with his first solo exhibition at the Galerie Denise René held only in 1946. Other exhibitions followed in 1952, 1954 (paintings 1953–1954) and 1960 (catalogue text by Jean Cassou). The principle of abstract painting on which he based his work is analysed in his book L’Art non figuratif non objectif (Galerie Lydia Conti, 1949). He added to a repertory of geometrical forms such as circles, squares, rectangles, diamonds and triangles, bright contrasting colours that owe much to Goethe’s Theory of Colours and which were chosen according to their symbolic power. His pure sober work had a major influence on the younger post-war abstract artists and in particular on the practitioners of geometrical abstraction. A founding member of the Salon des Réalités Nouvelles, Herbin was a regular exhibitor there from 1946 until the end of his life and a member of the Comité Directeur until 1955. Among the group exhibitions, we should mention: Tendances de l’art abstrait, Galerie Denise René in 1948 which, in 1950, also showed Quelques aspects de l’art d’aujourd’hui. In 1951 the Galerie organised Klar Form – Vingt artistes de l’École de Paris, an exhibition shown in the Scandinavian countries and in Belgium. In 1952 he again showed at the Galerie Denise René in Paris in Douze tapisseries inédites woven by the Tabard workshops at Aubusson, with Kandinsky, Léger, Magnelli, Le Corbusier, Arp, Dewasne, Deyrolle, Pillet, Mortensen, Sophie Taeuber-Arp and Vasarely, and in the exhibition Diagonale. Herbin took part in all the group exhibitions organised by Denise René abroad: in Hamburg in 1953, in Liège at the Association pour le Progrès Intellectuel et Artistique de la Wallonie (APIAW) with Bloc, Dewasne, Deyrolle, Mortensen, Poliakoff and Vasarely in 1954, in Rio de Janeiro in 1955, in Rouen Art 1955, Documenta Kassel 1955, in Grenoble Dix ans de Peinture française 1945–1955 in 1959 at the Leverkusen Museum, International Sezession 1956, Charleroi L’art du XXIe siècle 1958. In Paris Hommage à Léon Degand in 1958. In 1959 the Galerie Simone Heller gave a first retrospective, followed by the Palais des Beaux-Arts in Brussels in 1956, and Fribourg in 1958. Other solo exhibitions, in 1958 at the Galerie Henri Bénézit. 1972 Herbin. Galerie Denise René Paris. Catalogue, text by J. Lassaigne. Retrospectives at the Musée Cambrai in 1980 and Vitry-sur-Seine, works from 1905–1960. Catalogues. Museums: Paris, Musée National d’Art Moderne – Le Cateau-Cambrésis (salle Herbin Musée Matisse). Grenoble. Peissi: Hommage à Herbin, text of the talk given on 28 April 1952 during a lecture cycle organised by the Atelier d’Art Abstrait, 44 rue de Rennes, Hofer, Paris, 1952. Témoignage pour l’art abstrait. Art d’Aujourd’hui, Paris, 1952. Massat: Auguste Herbin. Coll. Prisme, Paris, 1953.